"Boards Boards Everywhere - Not a development to be seen"
Mamata Banerjee, somehow, has been able to evolve a relatively unique, efficient and effective tool to progressively sideline more than a century old political aspirations of the Gorkhas for a separate state of their own through the establishment of a series of Boards commonly called ‘Development and Cultural Board’ designed on ethnic and communal lines. The idea of cultural and development board was initially mooted to protect the socio-cultural and economic interests of the Lepchas in the proposed Gorkhaland region. But the idea was little different at that point of time. It started with ‘Mayel Lyang Lepcha Development Board’ in 2013 followed by ‘Tamang Development Board’ in 2014 and ‘Bhutia Development Board’ in 2015. 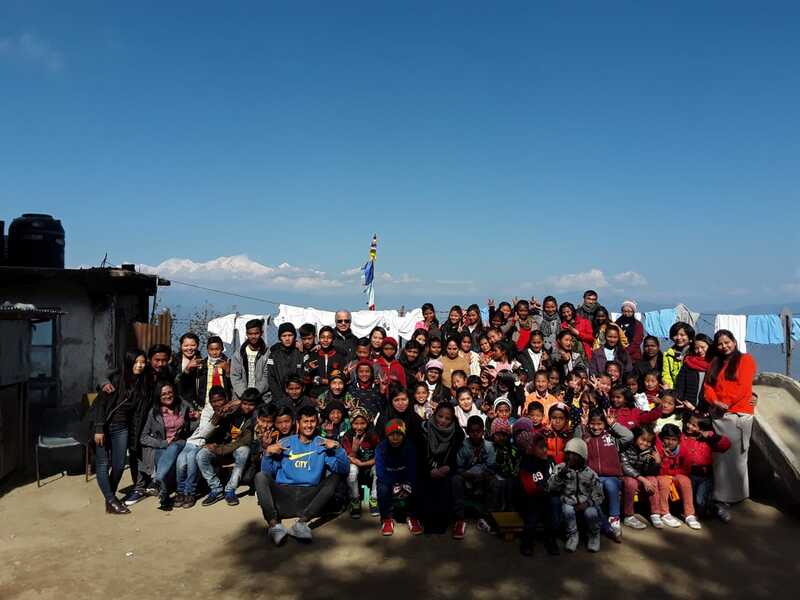 From amongst the larger Gorkha community, Limbu and Tamang were the first groups to aspire for a development board of their own. Gorkhas, particularly younger lots, saw money flowing through these boards and could not resist their temptation. 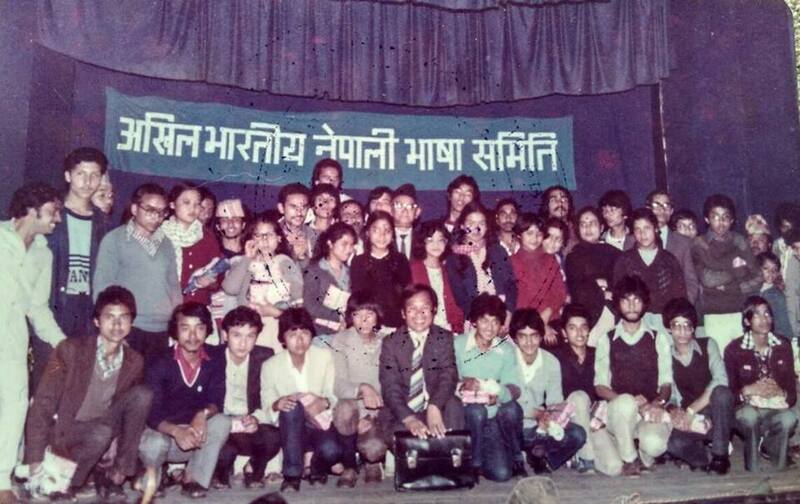 Soon after, almost all sub-Gorkha groups started to make noise, like seasonal insects, for the ‘boards’ of their own, forgetting and more pertinently disregarding the larger collective Gorkha aspiration of separate state. Mamata Banerjee immediately understood and internalized that the very idea and concept of ‘Board’ was the perfect recipe to tackle the dejected Gorkhas and a critical card of the moment to dislocate and dismantle the bigger political aspiration of separate Gorkhaland state. Consequently, she took full advantage of the situation. 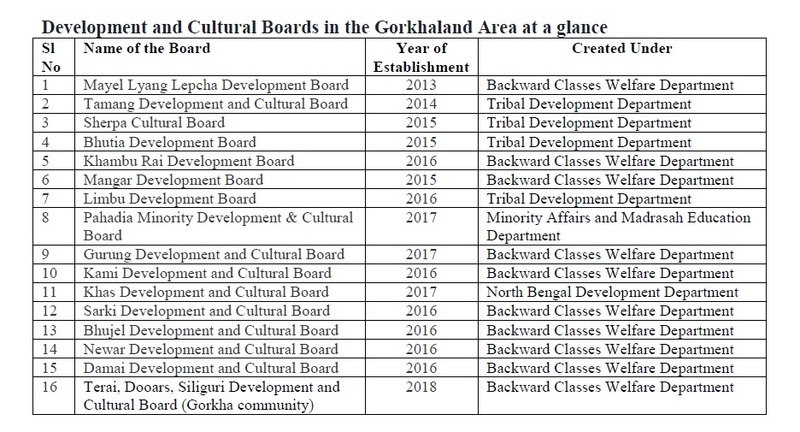 Eventually, by the end of 2017, 15 odd ‘Development and Cultural Boards’ were formed for the Lepcha, Bhutia and Gorkha Communities of the proposed Gorkhaland region. Not surprisingly, Government of West Bengal yet again notified another development board called ‘The West Bengal Terai, Dooars, Siliguri Development and Cultural Board (Gorkha community)’ on August 13, 2018 making a total of 16 development boards. While the first 15 boards have been formed on communal line, the last one is based on geography. Development Boards are, fundamentally, NGOs without any teeth. 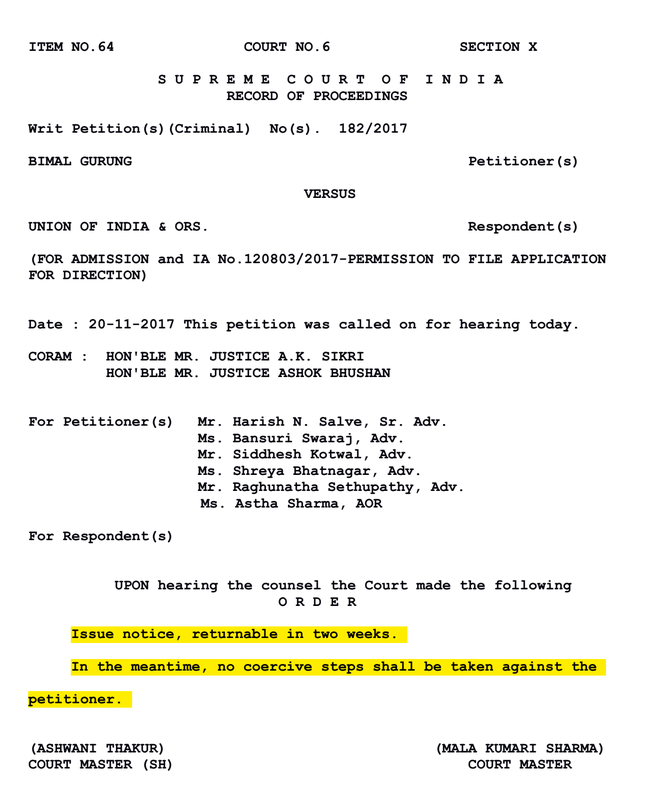 They are registered under The West Bengal Societies Registration Act, 1961 and may be dissolved in accordance with the provisions under section 24 and 27 the said Act. All the members are nominated and removed by the government of West Bengal. Development boards, ironically, are expected to be multi-tasking agencies. Very ambitiously, they aim to act as peace broker, research institute, development agent, museum and archival center, contractor, conservator of traditions, heritage and language, protector of the environment and many others. Sadly, they do not have the capacity and expertise to fulfill most of the objectives set forth by them. Barring few like Lepcha and Bhutia Boards, almost all the development boards are breakaway faction of their parent organisation/association. They target youth wing of their traditional community organisations and vehemently permeate the philosophy of divide and rule policy. They have divided the fragile, dynamic and evolving Gorkha community and have done irreparable damage to the social fabric of larger Gorkha identity. Development boards have not been formed under Gorkhaland Territorial Administration (GTA) but under other departments of the Government of West Bengal (see the table) and therefore are not answerable to GTA. Such an arrangement often creates conflict of powers and interests between the boards and GTA. Consequently, bigger interests of the Gorkhas have been sabotaged with the formation of development boards based on communities. Lastly, but not the least, West Bengal’s project of ‘Development and Cultural Board’ in Darjeeling and Duars region is nothing but a populist approach to appease people on communal line. It will eventually fragment and divide the Gorkha society in the long run and will not address the fundamental issues for which Gorkhas have been collectively fighting for more than 110 years. *Dr. Vimal Khawas is the Head of the Department, Peace and Conflict Studies, Sikkim Central University. 1 Comment on "Mamata, Development Boards, Darjeeling-Dooars and the Gorkhas: Apprehensions and Implications"
So called developement boards are noting more then NGOs which are funded with negligble amount or to say much less amount for the Darjeeling Dist.out of annual budget. We Gorkhas have been living the lives in property since ancient time and the heads of these developement boards are die hard for the money and have no sense at all the damaged done to our communities and the century old demand for a seperate statehood on the basis of the territories comparising the entire Duars Terai and hills of Darjeeling Kalimpong which were EXCLUDED AND PARTIALLY EXCLUDED AREA OR TREATY OBLIGATORY AREA. On the other hand YOU is watching as a mute spectator past more then three decades helplessly. Needless to say The HILLS of Darjeeling with its Terai known as Siliguri was ceded to British India by Nepal on 2nd December 1815 vide the treaty signed at Sugauli is now being claimed by the people of Nepal headed by one Mr Fanindra Nepal and GOI will not have any option in future except to make Darjeeling and Uttarakhand like present Kashmir as GOI is not interested to support the patroitic person/s. We just have to wait and watch the future of so called Gorkhas who know nothing about their own future ahead.